This article may or may not help you to solve your noise problems inside PC. It all depends what kind of power supply you have in the pc case. So i would like to say that even if you buy and mount components mentioned in this article, there may be no improvement at all. Please read first, and then decide whether or not you should go to store. A large amount of time was spent by a friend of mine in searching of noise source in his PC. He was building hardware mp3 player (at the time when there were no hardware mp3 players), and he wanted to make sure the noise level is acceptable. Being audiophile, he noticed a lot of noise coming from his hardware mp3 player. It was also obvious the noise is not "transistor" like, but rather 50Hz with its harmonics and also somewhere on 15kHz. He started the search. First by connecting all "mass" to the same point, then by re-ironing all contacts again. But it didn't help. A friend of his also wanted the same mp3 player so he visited him. After the mp3 player was made on the second PC something strange happened. There was no noise. He took out the oscilloscope, recorded all on DAT, analyzed it and there was no doubt the second mp3 player is much less noisy. Indeed strange. But what could it be? It didn't took too much time to find out where the problem comes from. He took power supply from the second mp3 player (the one that was ok) and put it in the first mp3 player. Bingo! The noise was now low in the first mp3 player. So it is the power supply that is making noise! The rest is simple. If you have some basic knowledge you don't need to think twice what to do now. Just filter it, and the noise is gone. Again there was some more work to do. 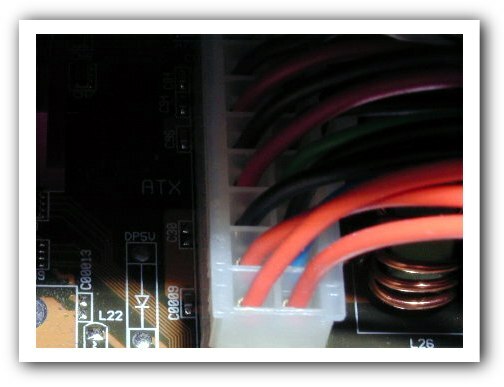 If you look at the power supply, you'll see that there is more than one wire there. Which to filter? Again lot of research and the results pointed that the 'bad guys' are +12V and -12V lines. All other lines are acceptable. Ok, you might ask, how to filter the +/-12V supply? Do i need to spend a week creating and building some component? No. Some people have already done the job for you. The device is called Noise suppressor and it is a thing that you put in your car in front of the CD player to remove the noise. You can do the same on the PC, just imagine that the CD player is the motherboard. 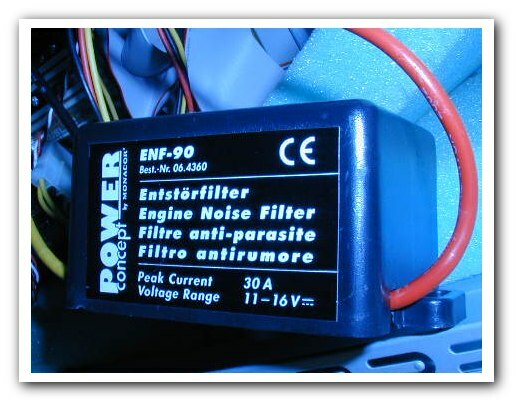 Noise suppressor can usually be found by this name and the best place to find this device would be car audio shop or some better electronic store. Make sure the device you buy can handle up to 30 A. This is very important! If you can't find the device, here is a picture below to help you, once you get to store. Noise suppressor is a very simple device, and how to connect it to a power line is described in the package where suppressor is. I won't take too much time in describing something that is already described. The more interesting is practice approach to the mounting problem. It is because the suppressor is quite big, and if you plan to put two of them, it will take some space. The best is to put them in one of the drawers above the disks (see picture below). To have enough wire for that, you'll need to cut +/-12V wires right in the middle between supply and board. But more better would be for you to measure first, and cut later. The mounting and fixing is up to your own decision and desire. If for some reason you can’t find the suppressor, you can build one. Here is a scheme below to help you. No much to explain, since the scheme is very simple. Just keep in mind that what is marked with “+” is actually +12 or –12V wire (depends to which one you are connecting) and what is marked as “–“ is actually the ground. I just need to ask you to read the motherboard manual before you start any work. If you don’t have the manual, please do not work. Here are some facts. Please read this before you buy. Since most of us have grounded sockets, and more less quality power supply in the PC, there will be no big difference if you put suppressor! Please keep that in mind before you go to store! I don't want to be responsible in any way if you buy suppressors and nothing changes. Good tip: If you are not sure if your power supply is good or bad, you can start with buying just one suppressor. If you notice the difference, you can buy another one. The fact is that they only do good, and nothing goes wrong if you insert them in you PC. Just don't expect too much. In first example we had a case of bad power supply. 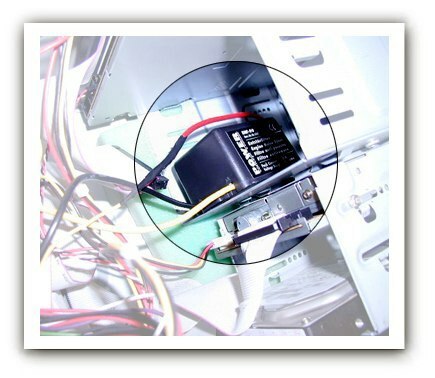 Now we will describe the case with non-grounded socket. For some reason in one room i don't have ground socket. In the other one i do. So it was easy to do tests "before" and "after" all compared with grounded and non-grounded socket. Sounds complicated, but here is what i did. Without Noise suppressor i first recorded 10 sec on grounded socket and then 10 sec on non-grounded socket. One hour later after i mounted noise suppressor and did the same recording. Before analyzing these files amplify all of them for about 55 dB or more. Just don't use normalize function! You need to amplify all of them for the same amount. If you ask me why you need to amplify them in the first place, well, it is easier to work when you see something on the screen. Since most spectrum analyzers are level dependent, you need to amplify something that is silent to read it easier. For recording and analyzing i recommend one of the best scientific audio programs, Cool Edit. Shareware version will do the job. If you like it, you can later buy it. There are also some other programs. It is important that you find function amplify, level or volume (or some similar name). Also you'll need function called spectrum or frequency analysis in that program. If you can't these things, throw away the program, it is probably for the kids. Results are as following. On non-grounded socket, after mounting noise suppressor the hum at 50Hz disappeared as seen on picture above and overall result is really good. The picture represents situation before and after one suppressor mounted on +12V. As you can see, one noise suppressor solved my noise problem. I said solved, because results are now identical to the grounded socket with no noise suppressor. This means that now with the suppressor on non-grounded socket i have reached the low noise level which is now the same as on the grounded socket. On second test with grounded socket, there was no change at all, before and after mounting the suppressor. This tells us that if the power supply is good, noise suppressor won't do much. We saw two different examples of good results achieved with noise suppressor. On the other hand we saw that on a computer with a good power supply connected to grounded power socket, there was no change at all. Unfortunately i don't have the list of good and bad power supplies to tell you whether you need to mount suppressor or not. This part is up to you and your own research. In case you find power supply as a generator of noise, buy suppressor now! They are not so pricey so you can always get one and try, and if it works, buy another one. Remember, first one goes to +12V and the second one goes to -12V.